iRiver IMP450 Portable MP3 / CD Player - iRiver brings you the original, award winning, ultra-slim portable MP3 and WMA portable CD music player. 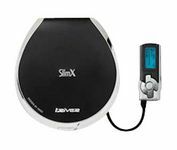 While the SlimX is only 16.7 mm thin, it is packed with features, including a built-in FM Tuner, 4 line Backlit LCD remote, 16 min skip-free music playback letting you listen to hundreds of your favorite songs on a single CD! Includes 2 NiMH rechargeable batteries with built in charger, amazing battery life of up to 55 hours, AC adapter, AA battery adapter, carrying case.